A policy is an object in AWS that, when associated with an identity or resource, defines their permissions. When you create a permissions policy to restrict access to a resource, you can choose an identity-based policy or a resource-based policy. Identity-based policies are attached to an IAM user, group, or role. These policies let you specify what that identity can do (its permissions). For example, you can attach the policy to the IAM user named John, stating that he is allowed to perform the Amazon EC2 RunInstances action. The policy could further state that John is allowed to get items from an Amazon DynamoDB table named MyCompany. You can also allow John to manage his own IAM security credentials. Identity-based policies can be managed or inline. Resource-based policies are attached to a resource. For example, you can attach resource-based policies to Amazon S3 buckets, Amazon SQS queues, and AWS Key Management Service encryption keys. For a list of services that support resource-based policies, see AWS Services That Work with IAM. With resource-based policies, you can specify who has access to the resource and what actions they can perform on it. Resource-based policies are inline only, not managed. Resource-based policies differ from resource-level permissions. You can attach resource-based policies directly to a resource, as described in this topic. Resource-level permissions refer to the ability to use ARNs to specify individual resources in a policy. Resource-based policies are supported only by some AWS services. For a list of which services support resource-based policies and resource-level permissions, see AWS Services That Work with IAM. To better understand these concepts, view the following figure. The administrator of the 123456789012 account attached identity-based policies to the JohnSmith, CarlosSalazar, and MaryMajor users. Some of the actions in these policies can be performed on specific resources. For example, the user JohnSmith can perform some actions on Resource X. This is a resource-level permission in an identity-based policy. The administrator also added resource-based policies to Resource X, Resource Y, and Resource Z. Resource-based policies allow you to specify who can access that resource. For example, the resource-based policy on Resource X allows the JohnSmith and MaryMajor users list and read access to the resource. JohnSmith – John can perform list and read actions on Resource X. 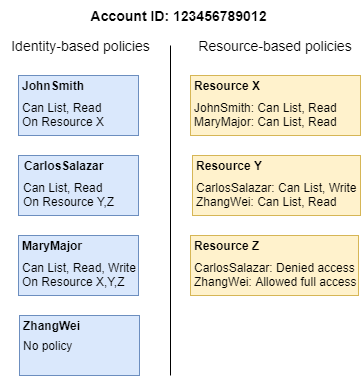 He is granted this permission by the identity-based policy on his user and the resource-based policy on Resource X.
CarlosSalazar – Carlos can perform list, read, and write actions on Resource Y, but is denied access to Resource Z. The identity-based policy on Carlos allows him to perform list and read actions on Resource Y. The Resource Y resource-based policy also allows him write permissions. However, although his identity-based policy allows him access to Resource Z, the Resource Z resource-based policy denies that access. An explicit Deny overrides an Allow and his access to Resource Z is denied. For more information, see Policy Evaluation Logic. MaryMajor – Mary can perform list, read, and write operations on Resource X, Resource Y, and Resource Z. Her identity-based policy allows her more actions on more resources than the resource-based policies, but none of them deny access. ZhangWei – Zhang has full access to Resource Z. Zhang has no identity-based policies, but the Resource Z resource-based policy allows him full access to the resource. Identity-based policies and resource-based policies are both permissions policies and are evaluated together. For a request to which only permissions policies apply, AWS first checks all policies for a Deny. If one exists, then the request is denied. Then AWS checks for each Allow. If at least one policy statement allows the action in the request, the request is allowed. It doesn't matter whether the Allow is in the identity-based policy or the resource-based policy. This logic applies only when the request is made within a single AWS account. For requests made from one account to another, the requester in Account A must have an identity-based policy that allows them to make a request to the resource in Account B. Also, the resource-based policy in Account B must allow the requester in Account A to access the resource. If policies in both accounts don't allow the operation, the request fails. For more information about using resource-based policies for cross-account access, see How IAM Roles Differ from Resource-based Policies. A user who has specific permissions might request a resource that also has a permissions policy attached to it. In that case, AWS evaluates both sets of permissions when determining whether to grant access to the resource. For information about how policies are evaluated, see Policy Evaluation Logic. Amazon S3 supports identity-based policies and resource-based policies (referred to as bucket policies). In addition, Amazon S3 supports a permission mechanism known as an access control list (ACL) that is independent of IAM policies and permissions. You can use IAM policies in combination with Amazon S3 ACLs. For more information, see Access Control in the Amazon Simple Storage Service Developer Guide.